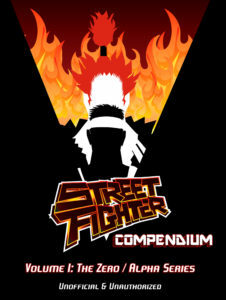 Street Fighter Compendium: Volume I addresses only the Zero / Alpha series. The prequel to SFII was a good springboard. At 85 pages, it covers the three main iterations of SFZ/SFA without being too big. However, I fully intend on covering additional titles in the Street Fighter franchise. The SFIII games, Arika’s EX titles, spin-offs and versus games and of course, Street Fighter II. If you’re interested in the series progressing, grab a copy of volume 1 and let me know what you’d like to see next! Let’s make this the most comprehensive coverage of our beloved Street Fighter series ever put together! I am curious though. Which series should be covered in Volume II – excluding the obvious, of course! Let me know!!! Outside Street Fighter II, Which Series Should Be Covered Next?